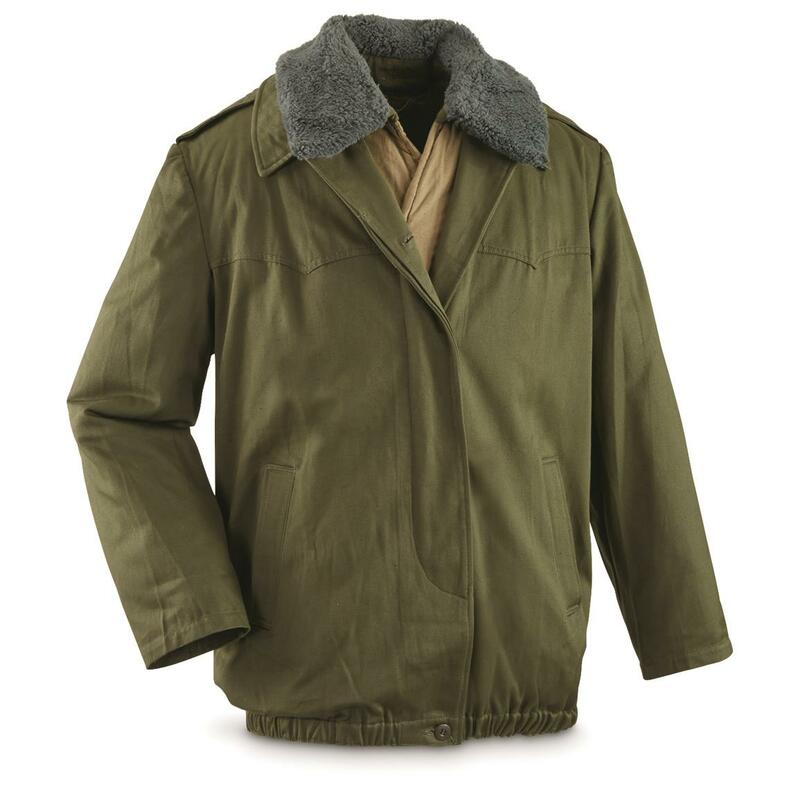 Beat the cold and look sharp doing it with this M65 Jacket. Military tough and armed with insulation to keep Hungarian soldiers warm. 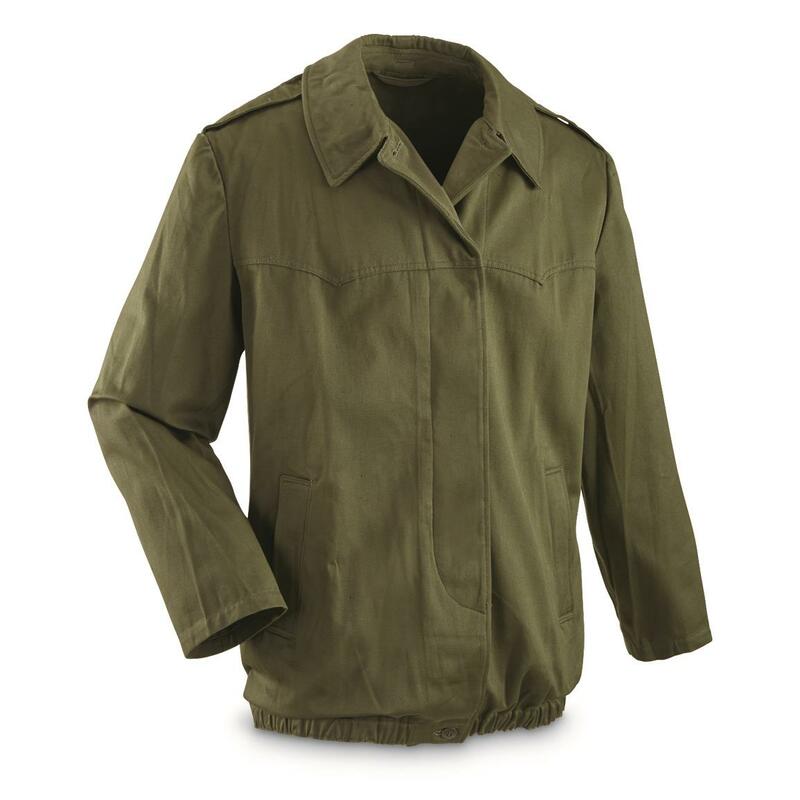 Similar to the American "Ike" jacket with its short waistline that makes for easy maneuvering in tight quarters. Elastic waist keeps jacket in place. A collectible, comfortable, wearable Cold War relic. Hungarian Military Surplus M65 Jacket with Quilted Liner, OD, New is rated 4.3 out of 5 by 7. Rated 5 out of 5 by Ranger from Great deal and jacket Get 1 size larger than what you normally wear. Brand new military issue that looks and feels great; I will be buying another for a spare. Rated 4 out of 5 by Mad Dutchman from Hungarian Surplus M65 Overall it isn't a bad jacket. But the elastic around the bottom causes it to ride up sometimes, causing the fake fur to grate on your jaw line and neck. I'm a 38R and the large is too large for me, which may have something to do with the fit issue. It is constructed very well, certainly not a flimsy jacket,Most of the time it's not even buttoned when I wear it.This jacket is very warm though and I'm happy with wearing it out working in the yard or on my truck in New England in the winter. Rated 4 out of 5 by SavageDDS from Wind blocking, warm, inexpensive Product received as described. Coat is heavy and runs slightly small to size. I'm a 40 chest an 32 sleeve and a large is about perfect. I bought this coat for an around the house/farm winter coat. For the price, you cant beat the warmth. 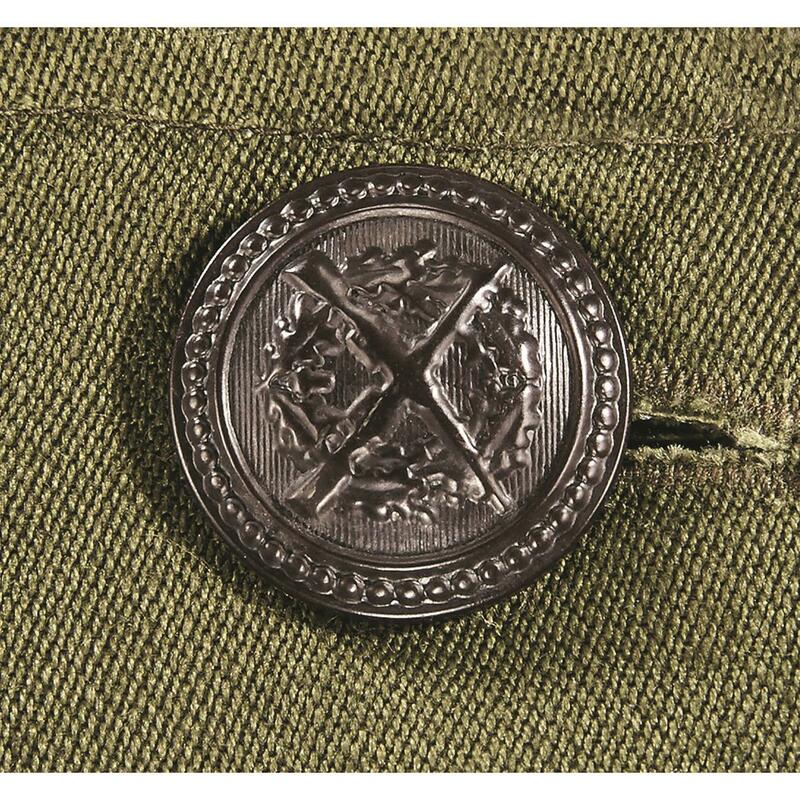 As is usual for European garments the buttons are on the wrong side but take only a few minutes to get used to. US surplus M65 liners will not fit into this coat and that may be the only drawback. The cotton liner is almost too warm and does not breath well (read: back sweat during minor activity at <32 degrees outside temperature) It does however prevent 20+MPH wind from penetrating. The bottom of the coat has an elastic waist which at first was awkward, but it stays put and helps keep cold wind out. I am really happy with this coat and will continue to wear it until it wears out. I will however still seek a US made M65 but those cost a lot more and therefore won't be worn in farm/ranch service. Rated 5 out of 5 by Lordofwyr from Really looks and feels nice and new The jacket and liner came and seemed quite heavy as a combined item in the box, but when worn are a good combination of warmth and wearability. Looks new to me and fits well. Rated 4 out of 5 by Military Phil from Size XL fits like Size L This item is new and well-made, with no tags, or labels. I wear XL, ordered XL...If I only wear a T-shirt under-neath, it fits snugly. 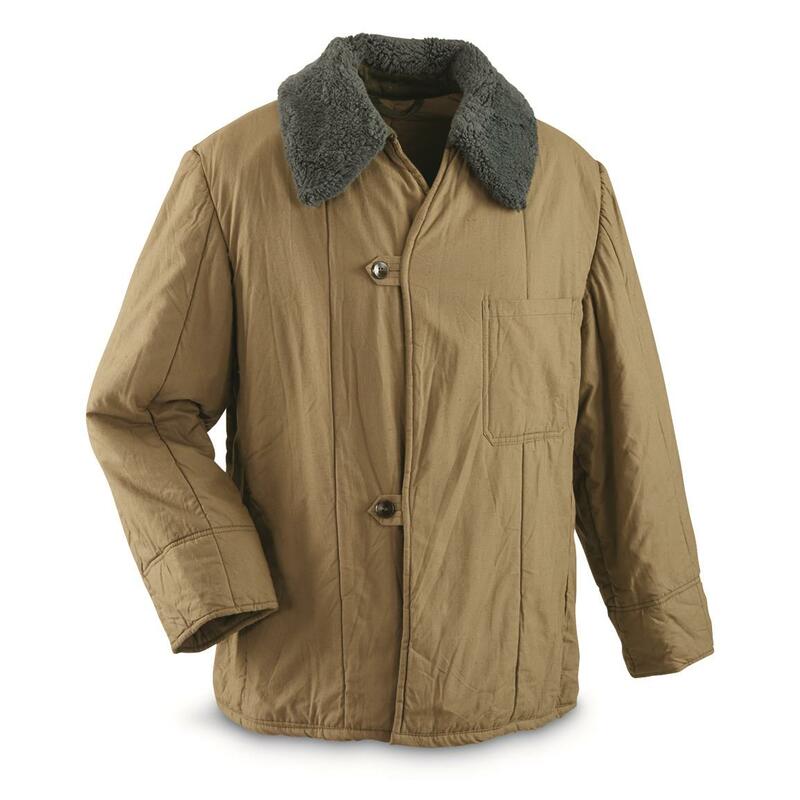 Jacket is a sturdy shell, and has a nice USA western fashionable look. Clean, new, fresh looking fabric, can be worn alone. Liner can be worn with shell (the collar is nice warm, fur-like) or alone. Liner is Khaki colour. Jacket buttons left (no zippers), liner buttons right. If the fit was larger I would order another. Rated 5 out of 5 by Anonymous from Hungarian Surplus M65 Jacket Superior textiles from Hungary. Not a flawless design as the liner and jacket don't match beyond the button in neck/collar. Sleeves do not have button-in features, and the liner's faux fur collar and the jacket collar don't really match. An awkward contraption to say the least, but it is a solid two layer device to keep out the serious cold. I'd say keep in in the trunk as a survival tool for below zero temps. Not for daily wear in any way or in any environment, save maybe the woods away from civilization. You go out wearing this in public and you're liable to get beat up by town bullies or run off by the women. I love it and am glad I bought one. Fit is good, just feels small with the liner in place because it is a bulky piece and the sleeves feel short because the wrist elastics are a couple of inches down from the wrist almost to the forearm. I love my Czech M65, and I wanted this Hungarian one to see if it was like it. It's not, but it'll do for an emergency in arctic conditions. Price is worth the risk to see if you like it, too. Rated 3 out of 5 by Rodney from Nice jacket, but too small Jacket received appeared nice and new, but XL fit like a L. Spent over $15 minimum at the P.O. to send a $29.99 item back for refund. Fortunately, initial shipping from SG was free, so no loss there. It's too bad that ordering such items is a risk: It might work; it might not. Would I recommend this product to a friend? Yes, but order the size larger. "Best Use / Intended Use" would apply to most anything casual.